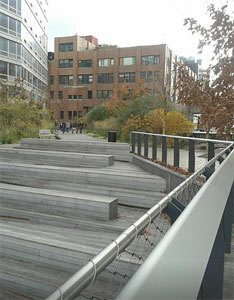 The High Line in New York - the old elevated train tracks now a park. Address: The High Line stretches 22 blocks, from 34th Street (between 10th and 11th Avenues) to Gansevoort Street and is 1.24 mile long. 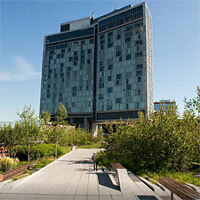 The High Line is open to the public and it is of course free! Take a walk and see everything from above...it´s opend to 7 PM all days. In summer time it is open longer. The High Line goes through the following areas: Hell´s Kitchen/Hudson Yards, West Chelsea and the Gansevoort Market Historic District. 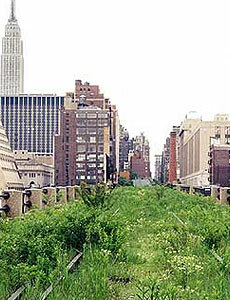 The High Line Park - green area in the city! The walking path opened to the public in June 2009. The old rebuilt railway has been built in several sections through the years. The last stretch will be completed in 2015. You can make your way up on various places along the road. Dogs are not allowed on the tracks. There are of course rules to follow when you are up here, as for example vehicles such as bicycles, skateboards, etc. may not be brought, you can not pick any plants, throwing garbage, etc. Bring some coffee and just sit and enjoy that you are in New York and then take some pictures from a pretty cool view from above. The track is handicap friendly. No problem for older children to come along! When beeing up here, you can look out over New Jersey and the Hudson River. The Actor Edward Norton is one of the those who support the preservation of the High Line in New York. Watch the movie where he meets one of the founders of the "Friends of the High Line" Joshua David. A stroll on the High Line. When you are in Chelsea. Plan a visit to Hotel Standard to Roof Top Bar "Boom Boom Room". Here you can see where the High Line is located on Manhattan. In 1999 the organization "Friends of the High Line" (FHL) started, it is a non-profit organization who wants to preserve the High Line. They have several different members, ranging from lawyers to ordinary citizens. 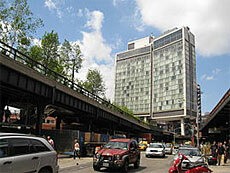 In 2002 a group of businessmen in the area where the High Line is passing started an organization dedicated to preserving the High Line. They call themselves the Chelsea-Village Business Owners (CVBO). Before The High Line was built, there were railroad tracks on street-level down Manhattan on the West side down to Canal Street. Then, when traffic began to increase accidents started to appear between trains, walkers, horses and other traffic. In fact the 10th Avenue was known as "Death Avenue." Later they also had men on horses who were riding in front of the trains with waving flags to warn, a train is coming! They were called "West Side Cowboys". Because of all the accidents they started to discuss other solutions. In 1929 came the idea of raising the tracks above the streets. The line stretched from 35th Street down to St. John's Park Terminal, which also covered the four blocks on the waterfront between Clarkson and Spring Street. The track was completed in 1934. The tracks would not go above the avenues, they went between buildings and then they were linked directly with the factories and stores in town. At this time the trains were carrying milk, meat, raw materials and other products without interfering with street traffic. In the 1950's, when trucks was mostly used for shipments, it led to stopping the trains on the High Line. Some parts of the tracks were torn down in the 1960s and the trains stopped going in 1980. After this more parts were torn down when other buildings were built, such as when the Jacob Javits Convention Center were built. News about what is going on! 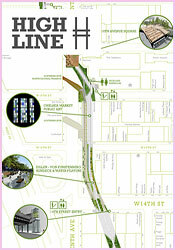 Here you can read news from Friends of High Lines. 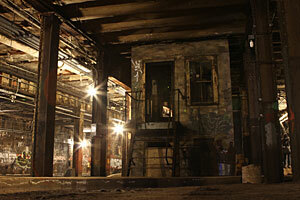 Lowline is a project to use solar energy to illuminate a terminal underground on the Lower East Side of New York City. The vision is that there will be an underground car park. The place has not been used since 1948 but there are nice features such as cobblestones, railway tracks and vaulted ceilings. The underground car park has plans to open in 2020. 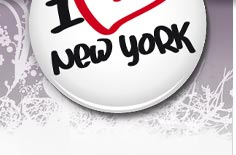 Address: Williamsburg Bridge Trolley Terminal, just below Delancey Street on the Lower East Side. New York's promenade above the streets got their inspiration from the Promenade Plantée - which was the world's first elevated promenade park when it came to 1993 in Paris. The park in Paris is twice as long.